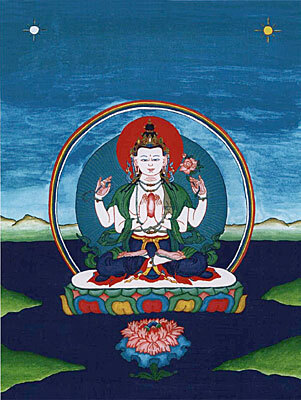 Buddha Avalokiteshvara is the manifested compassion of all the Buddhas. He appears as white in colour and holds a jewel at his heart symbolizing the deep love and respect he has for his Spiritual Guide. Within his right hand he holds a lotus showing that he has broken free from all obstacles to lasting happiness, like a pure white lotus blossoming on the surface of a lake. The crystal mala in his left hand represents his ability to rescue all living beings from their suffering.